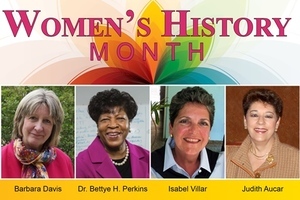 In proclaiming March as Women’s History Month in Westchester County, the Board of Legislators will celebrate the outstanding contributions of four woman serving the public good. This year’s annual celebration will take place Monday, March 25, 2018 at 6:30 p.m. at the Board Chambers, 148 Martine Avenue, 8th Floor, White Plains, NY. All are invited to celebrate their outstanding contributions at the Board’s March 25, 2019 meeting, when the Board will present proclamations in the women’s honor, and have the opportunity to hear them address the Board and guests.